Place fish in shallow glass dish. Mix lemon juice and walnut oil; pour over fish. Cover and refrigerate at least 15 minutes but no longer than 1 hour. Heat oven to 375°F. Drain fish; discard marinade. Sprinkle fish with marjoram and salt. Place fish on 12- to 15-inch length of aluminum foil or parchment paper. Top with tomatoes, bell pepper and onion. Wrap fish in foil, sealing tightly. Place on cookie sheet. Bake about 15 minutes or until fish flakes easily with fork. Use red, yellow or orange bell peppers for a more colorful main dish. 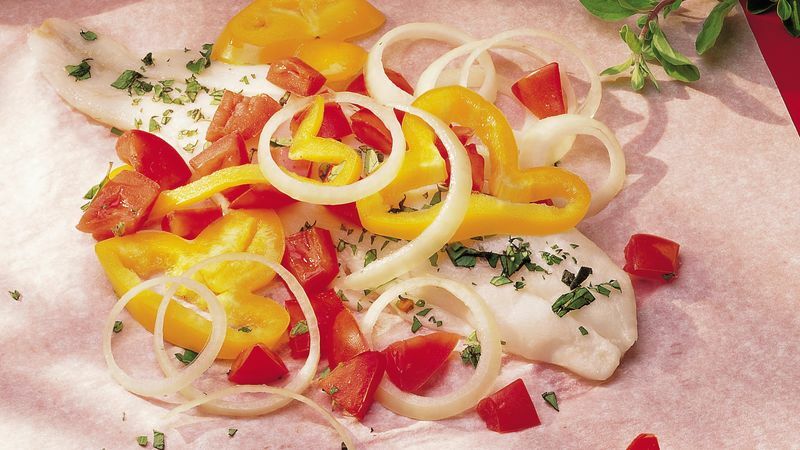 Orange roughy is considered a mild-flavored, delicate fish. Flounder, sole, Alaskan pollock and walleye pike are other good options.